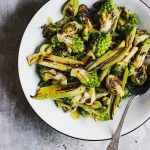 A charred, roasted romanesco salad with brussels and leeks, and tossed in a salty green olive dressing. A warm and hearty salad perfect for fall or winter. There is something incredibly majestic about the Pacific Northwest. The thick billowy clouds, greyish-smoky skies, cerulean mountain tops and vibrant green forests as far as the eye can see. 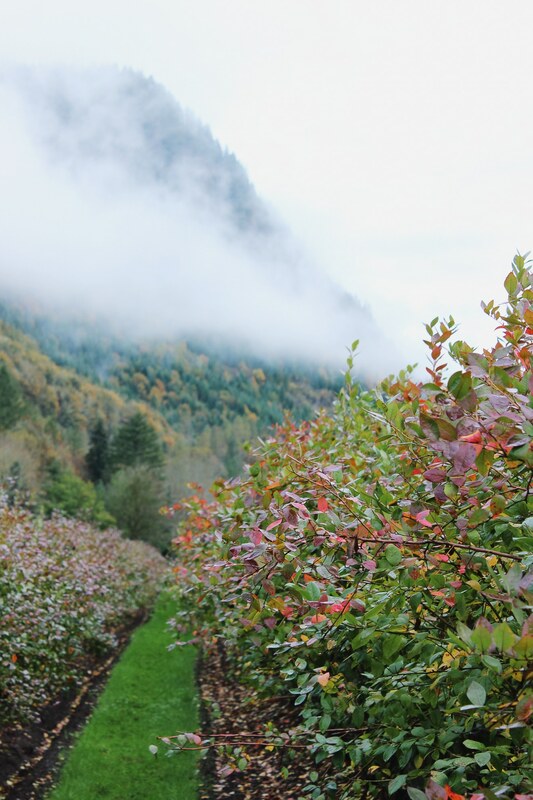 A few weeks ago, in between my jaunts back and forth from Philly to Denver – I was fortunate enough to take a trip out west to Seattle and visit the home of Cascadian Farm. Notes: this salad takes about 25 minutes to make and will feed 2 hungry people for a main event or 4 as a side. You could toss it with a pound of pasta and serve 6!! I like my veggies roasted to the point that they’re almost burnt, that to me is the best. Feel free to roast to your liking. Yes, Cascadian Farm is owned by General Mills. Yes, I have my apprehensions about that. The folks at Cascadian Farm, they’re fighting the good fight people. They were founded by Gene Kahn in the 1970s. Basically he was just a young kid who wanted to make a big difference in the world. But slowly overtime, he realized that in order to keep his dream alive he needed way more money to do it. So by getting funding from General Mills he was able to make that happen. 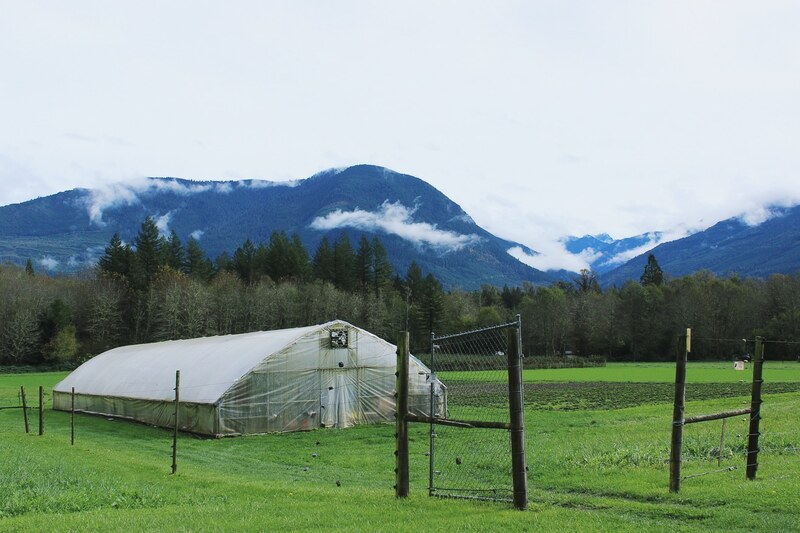 In short, I respect Cascadian Farm and the people behind their mission. Their passion to protect our planet is transparent and approachable. They offer affordable organic food options to people all over our country. They support initiatives like Bee-Friendlier, a campaign to protect our pollinators. Now onto this roasted romanesco salad. It is a simple combination of all the fall things that I love. I snagged all of these green veggies at my farmers’ market. Romanesco you guys, the beauty in every little nook and cranny is incredible. I could stare at it for hours. If you can’t find romanesco at your local market, cauliflower is a good substitute. This salad is extra special served warm, right out of the oven. Just the perfect amount of crispy and tossed lightly with a zippy green olive dressing. Halve the brussels sprouts. Cut the leeks into 3 inch long pieces and then slice them lengthwise. 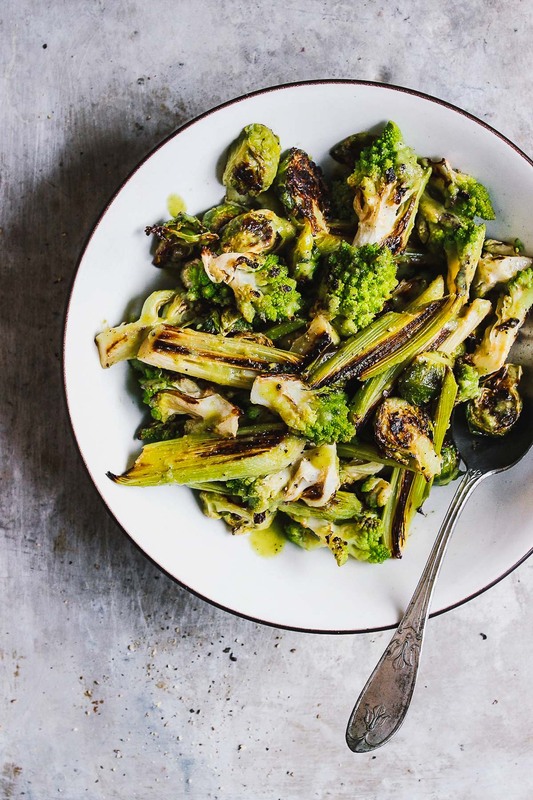 Toss the brussels sprouts, leeks and romanesco florets with 2 tablespoons olive oil. 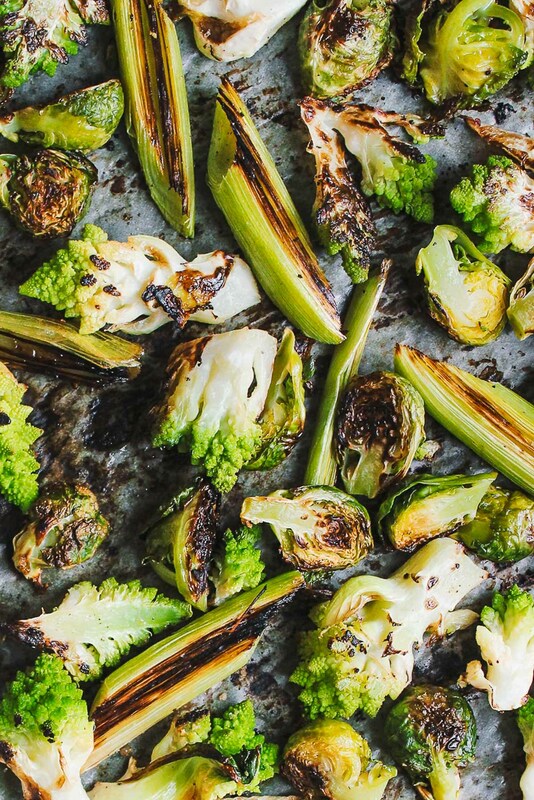 Spread the vegetables onto the baking sheet and roast for 20 minutes, flipping halfway. Meanwhile combine the remaining olive oil, olives, apple cider vinegar and a pinch of salt and pepper in a blender and combine until smooth. 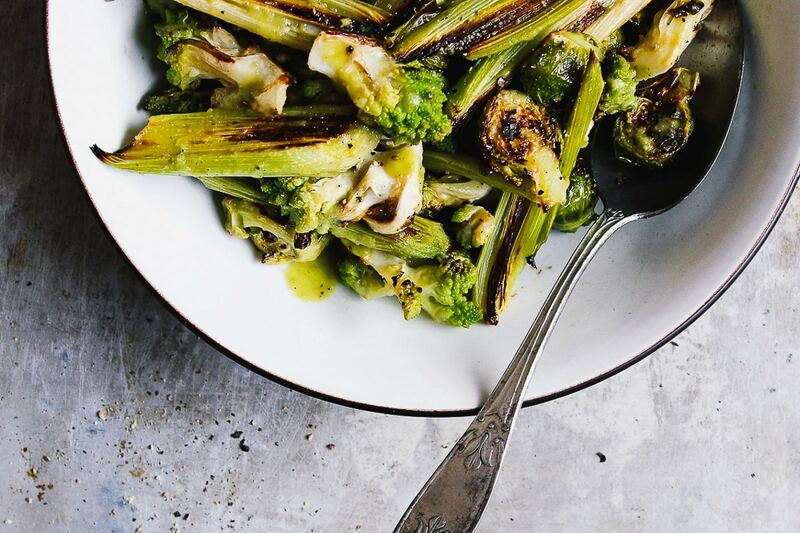 When the vegetables are done roasting, drizzle on the dressing, toss lightly, plate and serve warm. 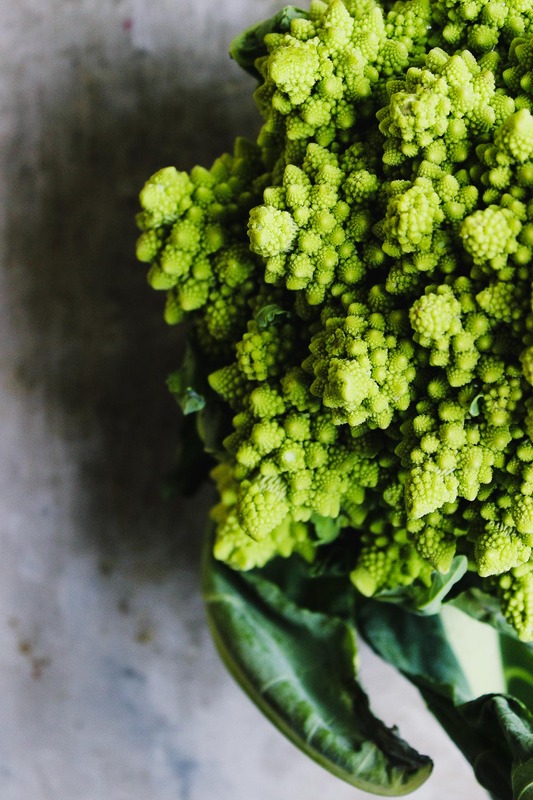 If you cannot source romanesco, either broccoli or cauliflower or a mix of both is a good substitute. More roasted salads you will love. This post is in partnership with Cascadian Farm a division of General Mills; all opinions are my own. Glad you had a great trip! I’ve had the pleasure of visiting Cascadian Farms before and it’s awesome! Looks so delicious – I love the bounty of green! So are we tossing the olives into the blender with the dressing or with the roasted veggies after they come out of the oven? You blend the olives into the dressing. I fixed the recipe, thank you for pointing that out to me, Amanda.